You may be surprised by the areas of your body that won't benefit from the recovery tool. There's a right and a wrong way to foam roll. What's more, there are some places on your body—ones that are quite commonly rolled out—that experts say you don’t actually need to be working on. There are even a couple that could potentially be dangerous. To save yourself time (and unnecessary pain), here are five areas to stop foam rolling. The most common reason athletes roll their the iliotibial (IT) band is to release tension, but according to Tom Myers, an integrative manual therapist and director of Anatomy Trains, this is completely pointless. "You cannot loosen your IT band,” he says. “If you were to exert the kind of stretch on your IT band that would be necessary to ease it out or make it longer, you would run screaming from the room before you put enough pressure on there to accomplish that goal.” That’s because your IT band is super strong. “It's absorbing half the weight of your body every time you take a step so a few times up and down with a foam roller, or even 30 minutes up and down with a foam roller, is not going to make it any longer." If you really want to roll this spot, it’s okay to do so, he says. "It's not so much that it's dangerous. It's more that you're not getting any benefit from foam rolling there." But a better bet is to ease the muscles at the top of the IT band, which are the muscles that if you put your hands on your hips, the palms of your hands would be over: the gluteal muscles and the tensor fasciae latae (TFL). "You might get some length into the IT band by relaxing those muscles," says Myers. Using a lacrosse ball or roller under your foot might feel good, but it's not going to do anything for you long-term. "You cannot lengthen the plantar fascia,” says Myers. “If it hasn't lengthened from years of walking on it, it's not going to lengthen because you put a ball under it and rolled it a few times." Again, it’s safe to do this if you want to, but it’s important to know that you likely won’t see any results from it aside from the fact it might just feel good in the moment. Your neck is the most dangerous body part to foam roll. “I instruct my patients to avoid foam rolling their necks,” says Rob Ziegelbaum, PT, clinical director at Zelik Ziegelbaum Physical Therapy in Port Washington, New York. “The neck is a very sensitive area, with a tremendous amount of neurologic and vascular structures,” he notes. It’s home to your jugular veins and carotid arteries, which are best not poked and prodded. “The pressure from foam rolling this area can potentially cause more harm than good,” Ziegelbaum adds. If someone is having neck pain, he advises that they visit a medical professional for an evaluation and skilled treatment instead of foam rolling. A massage or stretching might be the answer in the end, but it's delicate and you should get an expert opinion first. Though it’s fine to hit your upper back with the roller, the lower back, from just below your ribcage to just above your glutes, won’t see much benefit, according to Meg Furstoss, MS, and Andrew Borsellino, MS, the founders of Precision Sports Performance. “While many people experience low back discomfort and feel like foam rolling may help alleviate some of the pain, this is mostly not true,” says Borsellino. “Most back problems usually stem from somewhere deeper in your back.” In other words, rolling out the muscles that you can actually hit with a foam roller won’t help you get to the root of the problem. “Rolling directly over your spine can be uncomfortable,” Furstoss adds. Plus, it likely won’t have the desired effect since it can cause all the muscles in that area to tense up. Furstoss and Borsellino recommend using a tennis ball, lacrosse ball, or another smaller self-myofascial release tool to target specific (non-spinal) areas of your lower back. If you’re going to use a foam roller, position it parallel to your spine on one side or the other so that you’re not rolling over it. “However, we do recommend foam rolling the adductors and glutes/piriformis, which may help with lower back pain,” says Borsellino. Another spot you might want to try before hitting your lower back with a roller: “An often overlooked cause of lower back pain is tight hamstrings,” says Ziegelbaum. That’s because the hamstring muscle group attached to the part of the hip bone we sit on. The top of that same bone is where your lower back muscles connect. “Essentially, when the hamstrings get tight, they tilt the hip bones down, placing additional stress on the lower back muscles,” he explains. Because of this, working on lengthening your hamstrings with a foam roller can be an effective way to help relieve lower back pain and soreness. Elbows, knees, and ankles don’t need to be foam rolled. “Try to avoid rolling over joints like the back of your knees unless specifically instructed by a physical therapist or athletic trainer,” says Furstoss. “One of the aims of foam rolling is to improve muscle/fascial flexibility and mobility. As you get closer to your joints there is much less soft tissue (muscle, fat, etc. ), which lessens the effectiveness of foam rolling,” she adds. 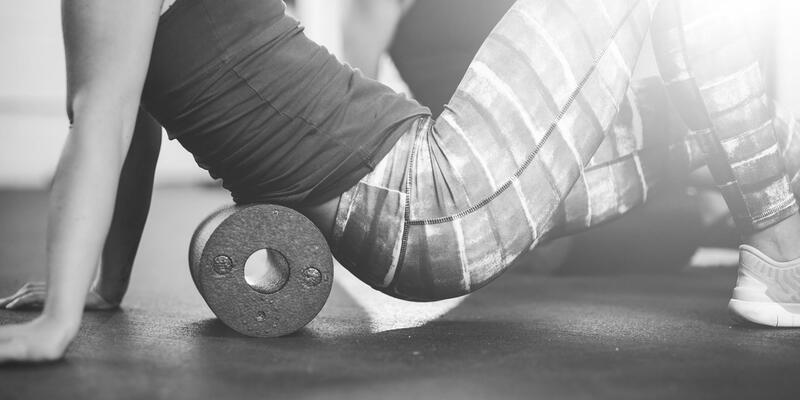 In some instances it might be helpful to use a roller closer to your joints, like if you have sore lower calves and ankles from running or fatigued forearms from weightlifting, but much like other delicate areas like the neck and lower back spine, it’s best to consult an expert before trying it out.